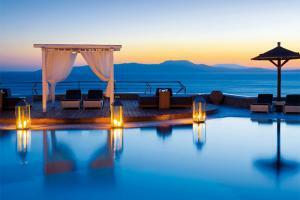 Mykonos Grand rises in harmony with its awe-inspiring setting. This luxury beach resort was conceived to capture the essence of its surrounding natural wonders and host guests with world class luxury and gracious service. Spacious rooms and suites present the embodiment of high luxury and genteel style, offering plush comfort and seclusion in a pristine locale. Located on the beach of Ayios Yiannis, just 2 miles from Mykonos Town. Dolphins of Delos, Aqua & Sole, White Bar, Pool Bar. Archaeological Museum, Delos Island, Nautical Museum, Folklore Museum, Tourliani Monastery, Mykonos Winery.